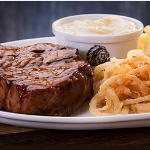 Bear Creek Spur Steak Ranch is a family style restaurant with a taste for life! South Africa’s favourite burgers, ribs and steaks. It is refreshing to eat at this Spur. The food is divine and I just love all the waiters friendliness. It is always fun to go to spur (Wilkoppies) the team is alway friendly and there to assist you when you may have a problem. When we leave we leave with a smile. I will always go back.